Happy March friends! If you’re like me then you’re probably asking yourself, “How the hell is it already March? !” The speed at which this year is flying by is crazy to me. And while the year has been full of great collaborations [Galentines Night was a blast!] and new adventures – the hustle of it all has caused some overwhelm. You too?!? We’ll over come it together! One way to overcome overwhelm – unplug! Kansas state University researchers found we need downtime, away from technology to allow ourselves to recharge. Yes that means parting with Instagram and turning off the TV to allow yourself to de-stress. You will survive, I promise! But…I’m slowly learning to unplug by setting aside time to make myself a cup of tea and journal. It’s a great way to create more “you” time and perk up your mood. You’ve come to the right place! 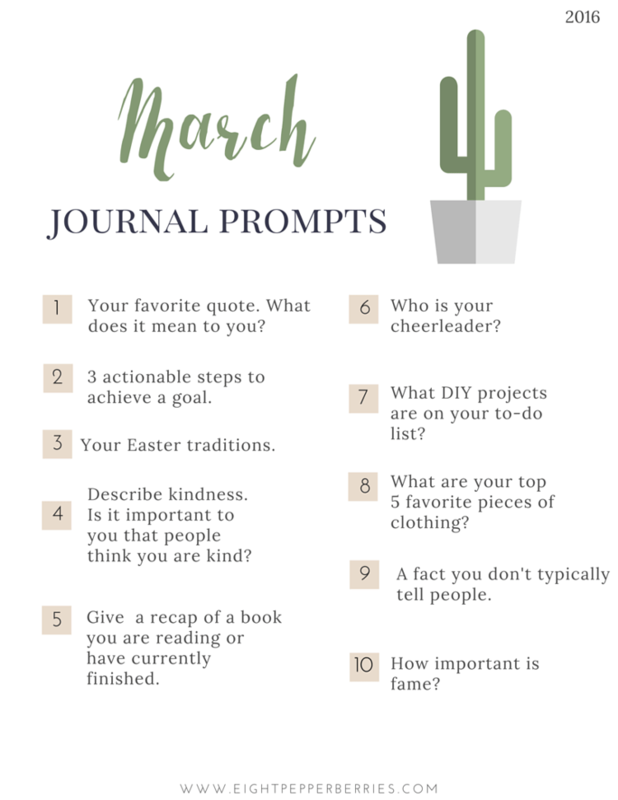 Each month I put out a new list of journal prompts that help guide you in your journaling process. You might focus on each prompt or pick and choose which ones are best for you. Remember, journaling doesn’t have to be just words on paper. Explore other avenues of expression: poetry, doodling, photos – it’s your journal, own it! Not sure where to start? You can find a quick start guide to journaling here. Keep a binder of all past month’s prompts for quick reference when writers block sets in. Get on the Eight Pepperberries list to be notified when the next prompts are released. You can sign up at the bottom of this post. Do you have a prompt you’d like to share? Write it in the comment section! Make sure you get next month’s prompts! Get on the Eight Pepperberries list and be the first to know when new prompts are released! I try to journal a little every day. I don’t really use the prompts though. Usually just a blurb or two about my day. I also keep a gratitude journal where I write down one or two things that I am grateful about from the day before. As for unplugging, I try to do that for a least a couple hours every day, but lately (the last few days) I haven’t been as good about it. Gotta get back into that habit. I haven’t made it up to unplugging a couple hours a day, baby steps I guess. Good for you for setting time aside to disconnect, I find that it really does clear my head and help me focus on other tasks.